He was clearly tweeting to me and all the other writers out there who include a recipe with their stories. We can’t help ourselves; a recipe without a story is just a science experiment. But if you unpack the ingredients by adding context, ingredients suddenly hold meaning, depth and story. And a good story, I think, will not only pull you in, it will send you down your own memory lane. Once upon a time, there was a granny named Gabriella Cristiani. Many years ago she and her husband rented an old overgrown Venetian villa on the island of Corfu with the hopes of opening a restaurant. The villa was ‘submerged in wisteria’ and so ‘full of wild herbs and magnificent magnolia, pepper, olive and fruit trees’ that they only had space for just a few tables. But it didn’t matter, said Gabriella; tourists were a rarity in those days. Eventually tourists, actors, writers and artists came and Gabriella fed them beautiful, simple food from the ocean and their garden. But she was shy and often found cooking and engaging with customers exhausting, so she relaxed from work by sitting in the corner of her kitchen with her knitting, embroidery or patchwork. Many years later, after her husband died and the restaurant was no longer, Gabriella moved to Nova Scotia to live with her daughter and grandchildren. While in Halifax she was approached to write a cookbook, one that captured the flavour of her restaurant in Corfu and celebrated her patchwork images of life in Corfu. 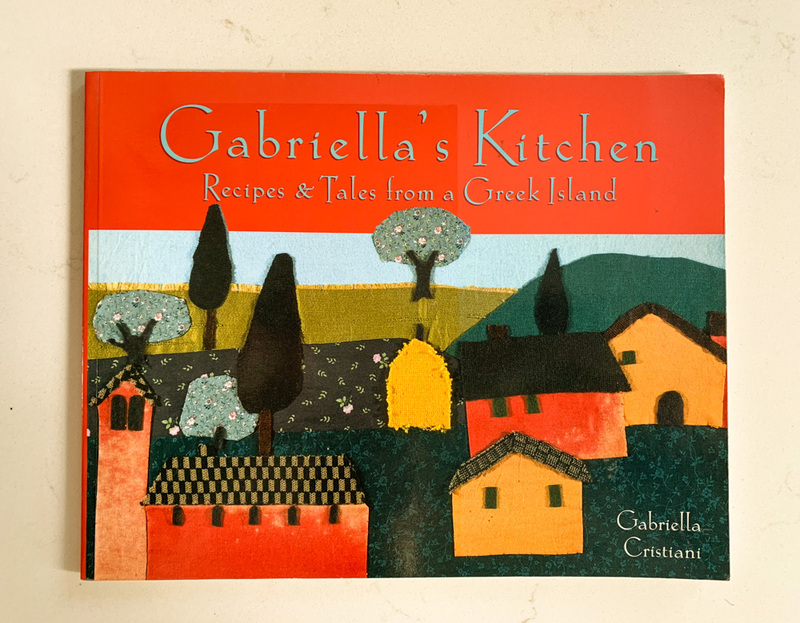 I profiled Gabriella and her cookbook for a local publication eighteen years ago. 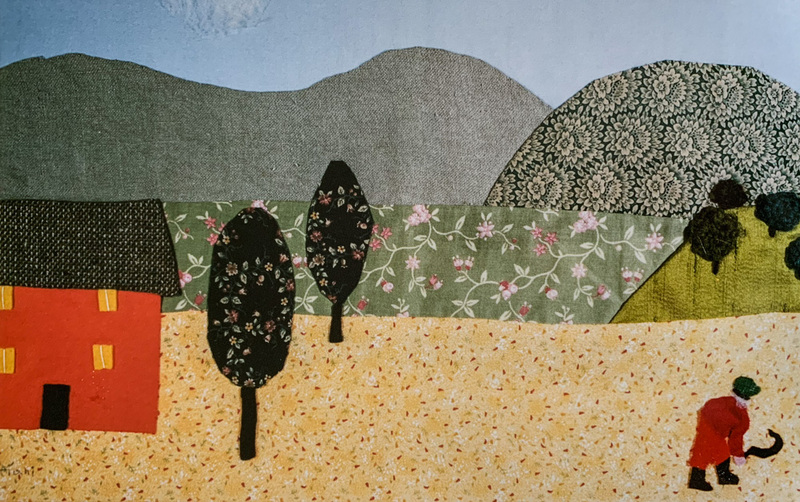 I touched her quilted art, rolling hills made from florals, rich silks and linens, with fields of hay made from speckled yellow cotton. She was so quiet, so modest, and I sensed she was also a little lonely. So I introduced her to my mother who hosted a weekly painting group. Soon Gabriella was sitting around my mother’s kitchen table, working on quilts and patchworks while the others painted. One morning, while sitting around my mother’s table, I mentioned I wanted to bring dinner to a friend who had just had a baby. Bring the ragu, said Gabriella. We’ve all been making it for ourselves, and others, ever since. 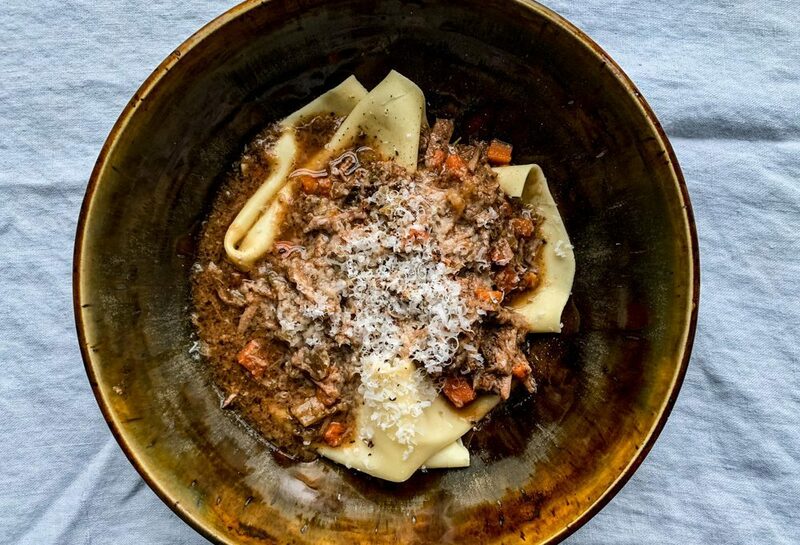 Gabriella’s ragu is like most ragus; stewing meat is floured, browned, then cooked long and slow with a soffritto, fresh herbs, wine and stock until the meat is so tender it falls apart. But unlike other recipes, Gabriella suggests adding the tomato paste towards the end. I’ve learned the hard way that if you add tomatoes (either paste, juice or whole tomatoes) too early, the acid in tomatoes will slow down the meat tenderization process. Don’t ask me the science behind this – there’s a reason why I’m a story teller not a science experimenter. Gabriella Cristiani’s RAGU (or ragout or ragù)– From Gabriella’s Kitchen- Recipes & Tales from a Greek Island, with a few tweaks and adaptions. This happens to a recipe as years pass, it’s all part of the story. Toss meat with flour to coat. Heat a large casserole (Dutch oven) over medium heat. Add olive oil and butter. When hot, add cubed meat in batches (if you fry them all at once they will steam, not brown). Turn over as they brown then transfer to a bowl (or slow cooker). When all cubes of meat are browned, assess how much fat is left in the pan. I had to wipe the pan out last time because I burned the excess flour lingering in the pan… if you do this too, wipe out the pan and add a fresh slick of olive oil – at least 4 tbsp – and another tablespoon of butter. Then add the chopped onions, carrots, celery, rosemary, thyme and a good pinch of salt. Slowly cook the vegetables (carrots, celery and onion are known as soffritto, the base of many Mediterranean sauces, soups and stews), stirring occasionally, until the onions have softened and the carrots and celery are heading in a soft, golden brown direction. I like to make ragu in a slow cooker, so at this point I transfer the soffritto to the slow cooker with the browned meat cubes. You can also cook the ragu in the dutch oven you browned the meat in. In both scenarios, combine the wine, milk, stock, salt and pepper with the meat and soffritto, bring to a boil then turn the heat down and leave to simmer gently (or set the slow cooker to low – 8 hrs) stirring occasionally, until the meat falls apart. This is where you can experiment – I highly recommend adding a few of Samin Nostrat’s suggested ragu additions – a parmesan rind, bay leaves, a fat strip of orange and lemon rind, a cinnamon stick and a grating of fresh nutmeg. Stir everything together and leave to simmer – or slow cook – away. After two hours of simmering, or 8 hours in the slow cooker, remove the flavour additions (bay leaves, cinnamon stick, rinds etc) add tomato passata or paste, stir, and leave to simmer for another 20 minutes or so. When ready, shred the meat by mashing it with a potato masher, then taste. The ragu might need more tomato paste or passata to add sweetness, or milk to make it richer, or a splash of wine, or a good pinch of salt or a grind of pepper. Go with what you think. Serve ragu over polenta, as Gabriella used to do, or over pasta. I serve it with lasagna noodles – I like how they fold over each other, creating a loose, deconstructed lasagna when topped with the ragu. But it’s up to you. If giving the ragu to a friend in need, just include a bag of dried pasta of your choice. They will love it.